A memorial to those victimized by Terrorism. L.A. anti-War activists built a makeshift memorial at the Westwood Federal Building for the victims of the September 11th. Terrorist attacks. Dozens of candles and bunches of flowers were left on the sidewalk in memory of those innocents who perished in the tons of rubble. 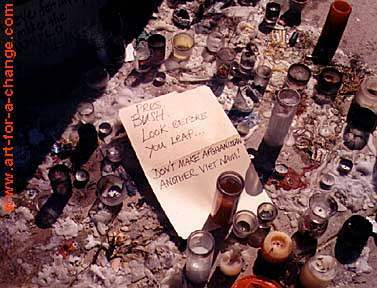 A hand written message at the memorial read: "Pres. Bush, Look before you leap... Don't make Afghanistan another Vietnam!" The STOP THE WAR COALITION (818) 402-8360, will be sponsoring another gathering for Peace on Saturday the 29th, 2 pm, at the Westwood Federal Building (corner of Wilshire Blvd. and Veteran).